This looks like such an expensive dish but in reality salmon and mussels are pretty cheap and it's so simple and tasty. Preheat the oven to 200oC, 400F, Gas Mark 6. Finely chop the shallot and warm some butter in a saucepan. While the oven is heating add the shallot to the saucepan and fry gently for approx 5 minutes or until opaque stirring occasionally. While the shallots are cooking, clean the mussels (see here on how to clean mussels). Add the garlic to the onion and fry for a further minute. Add in the wine and turn up the heat, reduce by approx half. Add the mussels to the saucepan and put on a lid. Turn to a medium heat and cook, lid on for approx 4 minutes. They are cooked when the shells have opened well (discard any which don't open). When the salmon is cooked, unwrap and put onto a warmed plate. 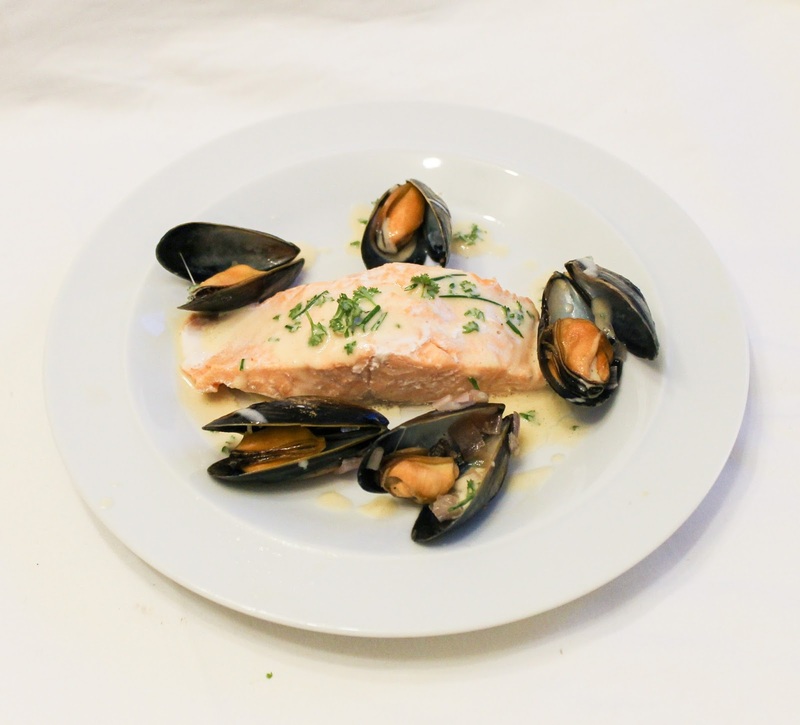 Then surround the salmon with the cooked mussels (take them out of the shells if you prefer). Add water to the sauce which has formed in the saucepan if too thick then add the cream. Bubble then strain to take out the shallots. 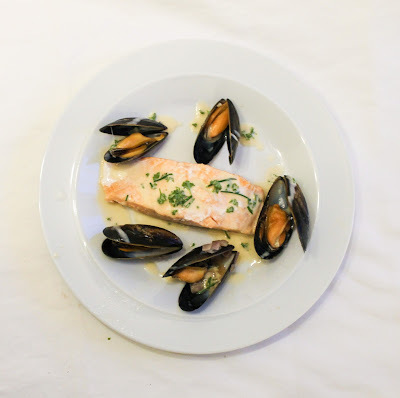 Add the chopped herbs to the strained stock and drizzle over the salmon and mussels. Serve with some lovely vegetables. Green beans or samphire would be perfect. Unfortunately I had neither so it was carrots and frozen peas. Oh well, we can't have it all!